02. 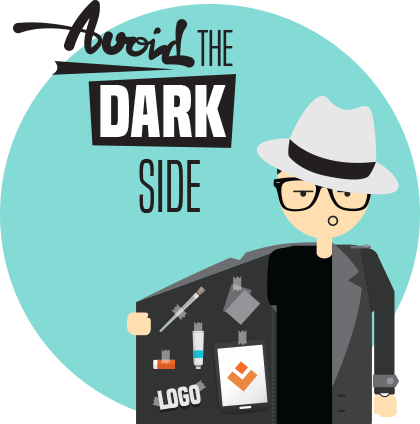 Avoid the dark side! Let’s get something slightly awkward out of the way early shall we? Are you the kind of business owner or professional who’s tempted to use a ‘design competition’ website for your creative needs? Or someone who places such little value in your company that you might trust someone (who may or may not have any design skills) to create the face of your company for peanuts? Those options come ladened with uncertainty and doubt and frankly, they’re not smart. Working with a professional design consultancy who is given time to get to know your business and your aims gives you surety and confidence that your needs are being taken seriously and there’s every opportunity for your business to be taken to a whole new level. A professional designer will add value, strategy and insight as well as creativity to help you overcome your challenges and connect more effectively. But they need to be good to do all those things. These bright, shiny, talented beings are out there and they’re relatively easy to find. Just don’t expect to find them on the dark side. Next week: 03. Don’t be pitchy!